When my son was in kindergarten, I borrowed my grandmother's hefty stone flour mill, and bought a bushel of wheat grains at the Shuk (market) in Tel Aviv for show and tell at his school's International Day. At the time, we had left our home in the DC area for a short stint as ex-patriots in Israel. It was coming full circle for me, living back home, where I was born and raised. My grandmother, tall and sturdy, a formidable woman with a great giggle, would clasp the wooden lever with both of her hands and in a circular motion turn the wheat grains in between the stones into whole wheat flour. It was a labor intensive, ancient practice. Back in Mumbai they had specialty shops to freshly grind the wheat grains for your daily bread making. Only on auspicious occasions, holidays and celebrations would my grandmother make her own whole wheat flour when living in India. With my grandmother going to work in Israel, to help with the household income, she slowly started using store bought all purpose flour. Whole wheat was not widely available at the time and with her working, time was elusive. Growing up in Israel, my palate was accustomed to the all purpose white flour flavor and texture in Indian flatbreads. In my adult life, here in the US, I am making, when appropriate, true to original and better for you, whole wheat versions of my family's flatbread heirloom, among other, recipes. The type of wheat grains used in flour vary from country to country which results in slightly different flavor, texture and moisture content. The Indian durum whole wheat, called Atta, is more refined than the American whole wheat counterpart. You can buy it at your nearby Indian grocer, but whole wheat flours are for the most part interchangeable. In an effort to learn more and share local Indian institutions' authentic Indian flatbread recipes, I reached out to Rasika's executive chef, Mr. Vikram Sunderam, nominated for a 2014 James Beard Award (best Mid-Atlantic chef) and Woodlands' owner, Mr. Anand Poojary. I was first introduced to Woodlands' cuisine at the annual Chanukah celebrations at the Indian Ambassador's residence. Woodlands', pure vegetarian (no eggs), southern Indian restaurant, caters the yearly December event. On weekends, many from the DC area's Indian community flock to the lunch buffet at Woodlands', after worshiping at the nearby churches and temples. Abundance of dosas, thin and crispy rice and legumes pancakes, the idlis, steamed savory rice cakes, and the pav bhaji, potatoes, peas and other vegetables mash, on a bun, highlighting Mumbai's Street foods, at the buffet. My favorite, Pani puri, a popular street snack, is a small fried and crispy puffed bread spheres, filled with potatoes, chickpeas and onion, then drizzled with tangy tamarind sauce and green chutney. Rasika, an upscale modern Indian restaurant, is a special occasion outing for heightened flavors and sensations of the exotic sub-continent. The Sindhi lamb Gosht from the north, and Kerala fish fry from the south, together with the famed palak chaat are unparalleled. No surprise that both restaurant and executive chef, Mr. Sunderam, garnered so many awards and accolades. The clay tandoor oven. at a minimum of 350F, had chicken kebabs cooking in it at the time. Chef Sunderam showed me how they slap the naan, Northern Indian leavened bread with yogurt in the dough, on to the walls of the tandoor and fish the bread out with specialty long metal skewers. Breads are usually secondary, playing a supporting role in a meal. At Rasika and Woodlands, however, they take center stage, and shine just as much as the protagonist, the main dish. The authenticity of the breads at Woodlands and refinement of the bread basket at Rasika are unparalleled. 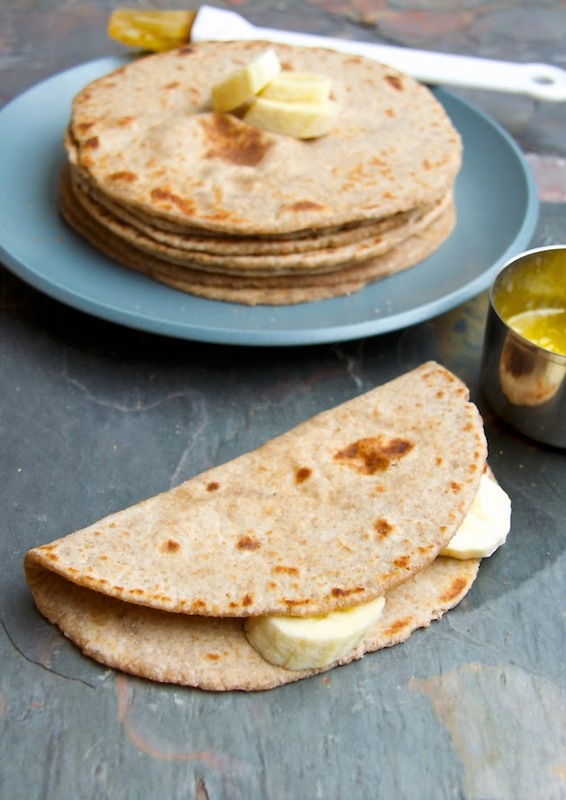 While discussing unleavened Indian flatbreads, Mr. Poojary mentioned, a little known fact, that in some cases, banana is added to the humble whole wheat roti (also called chapati) dough to make it softer, sweeter and more flavorful. It inspired me to develop a distinct breakfast banana chapati with caramelized bananas to top it off. Traditionally after the plain roti/chapati is cooked on each side until golden brown spots appear it is then directly put on open fire to swell and puff. It was fun to watch this step at Woodlands, but since the roti/chapati puffs on the griddle plenty, this step isn't necessary for the home cook. The breads at Woodlands' are strictly made on a griddle or skillets (called tawa/tava), in Southern Indian tradition. At Rasika's and Mr. Poojary's second restaurant, Jewel of India, you will find a tandoor clay oven, in Northern Indian fashion. Certain breads like naans are made in a tandoor oven while others are made on a griddle. When you make breads on a griddle or a skillet, according to Mr. Poojary, you can roll the dough out thin if you wish. For the tandoor, the dough has to be rolled out thicker so it won't instantly char. 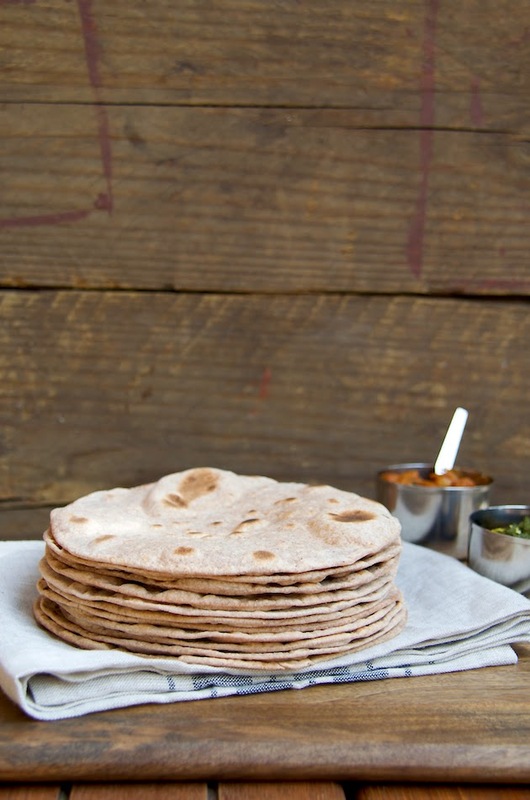 Parathas, a flaky layered flat bread, similar to the Yemeni Malawach, is most notably a northern Indian staple made with whole wheat. The same flaky, layered bread is used, according to my friend, Soma Rathore of eCurry, in an egg roll-up street food sandwich in her hometown, Kolkata. As a street food, parathas are made with unbleached all purpose flour according to Ms. Rathore and Mr. Poojary. In Malabar, a southern western coastal region in India, the parathas are made solely with all purpose flour. The Malabari chef at Woodlands' demonstrated the technique used in Malabar to roll out the dough. Sort of like tossing a pizza dough in the air, only stretching it super thin so that it's almost translucent. It takes much skill. It's an art. The stretched dough is then folded, before you got a chance to bat an eyelash, into an accordion. 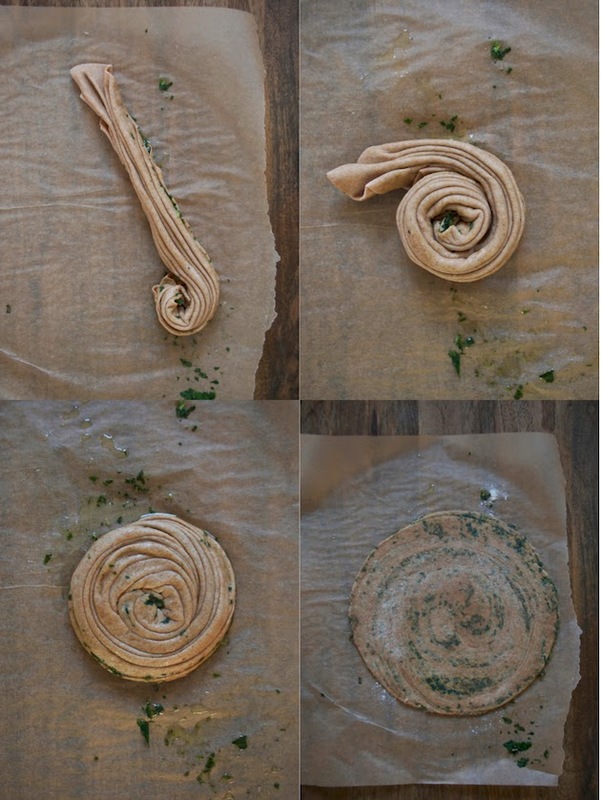 The pleated dough is then rolled into a snail, 'a pinwheel, spiral' as Rasika's, Chef Sunderam put it, and flattened with a rolling pin into a round flat bread. You couldn't apply the Malabari technique to dough made with whole wheat. It is quite fascinating how ingredients affect the techniques. While Woodlands' parathas were crispy from the outside and doughy from the inside, delicious, Rasika's parathas are thinner and herbaceous. The gobi (cauliflower) stuffed paratha at Rasika, piping hot, off the griddle, was a surprise sensation laced with the licorice dill twist. In Rajashtan, a northern Indian state, where Ms. Rathore's husband hails from, the cooked whole wheat paratha is brushed with ghee, clarified butter. The paratha is then cupped with both palms and crushed before serving. It is crushed to highlight the layers in the whole wheat paratha, The almost ceremonial crushing of the paratha demonstrated to me by Woodlands' chef is not practiced when making the Malabari paratha. The layering in the all purpose flour Malabari paratha is more distinct and easily detectable to the naked eye. The whole wheat is crispier, therefore more amenable to crushing. Over the weekend I tried my hand, to frustrating results and epic failure, at stuffed parathas. Stuffed parathas are another paratha making technique. I must have lost my touch, it's been too long. It was particularly frustrating since I've made the more complex Puran Poli, sweetened chickpea paste filled paratha, to perfection, time and time again in the past. Puran Poli is traditionally made with all purpose flour for the Hindu festival Holi and the Bnai Israel Indian Jewish community makes it for the Jewish Purim holiday. Both of which were just celebrated mid-March, last week. I was in awe and humbled watching the executive chef, Mr. Vikram Sunderam, a native of Mumbai, at work. His re-iterated to me the trick to stuffed parathas is to keep the filling as moisture free as possible. No wonder I was failing I used frozen green peas. The grated raw gobi (cauliflower) in Chef Sunderam's paratha is a stroke of genius. In my entire cooking 'career' I have never seen raw vegetables used in parathas. They vegetables or any filling for that matter were always pre-cooked. The amount of moisture drawn from the grated cauliflower by letting it sit, salted, for half an hour took me by a complete surprise. 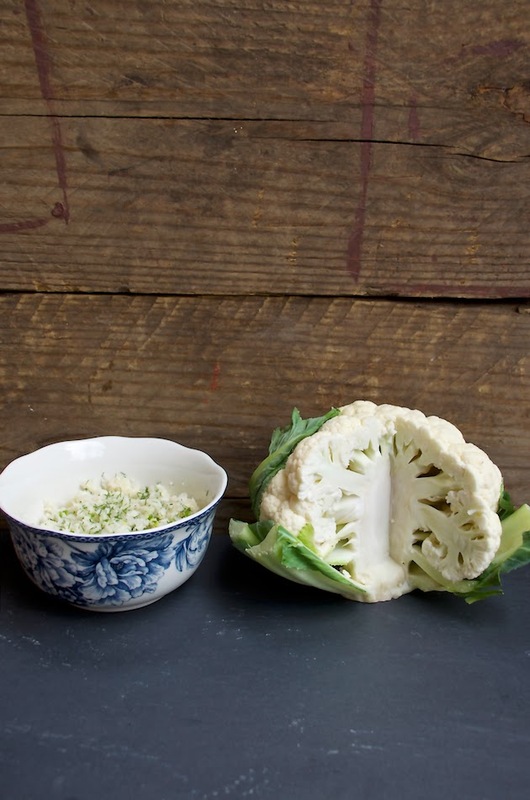 Who would have known cauliflower packs so much liquid?! 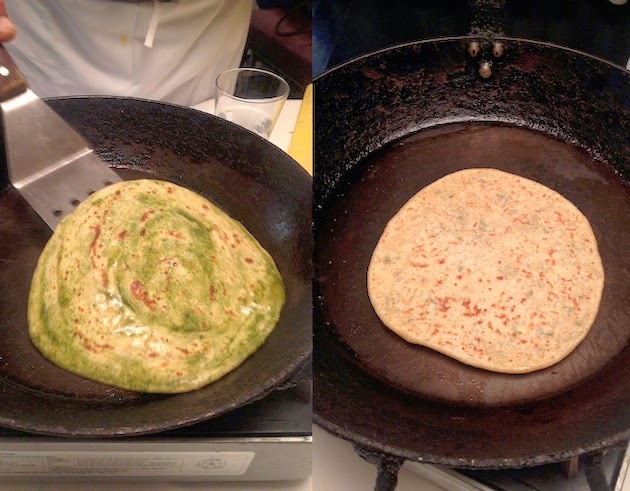 Last Monday, at Rasika West End, under Mr. Sunderam's tutelage my gobi (cauliflower) paratha was perfection. It must have been Chef Sunderam's confident guidance and inspiration. The subject matter is a mesmerizing, bottomless well of Indian flatbread making idiosyncrasies and information. My interest in exploring everything Indian flatbreads was sparked by my grandmother's flour mill that made it from Mumbai to Israel. I covet my grandmother's stone flour mill. To promise to grind whole wheat flour with it would be too ambitious. I covet it, even if only as a relic to sit idly at my doorstep. I yearn to posses this artifact and not the distinct yellow 24 karat Indian gold jewelry she has left behind. I can almost hear my grandmother's priceless, heartfelt giggle, at this. Many thanks to both, Rasika's executive Chef Vikram Sunderam, and Woodlands' and Jewel of India's owner Anand Poojary, for their exponential knowledge, welcoming me into their kitchens and sharing their recipes with TheWashington Post readers. A special thanks to Soma Rathore of eCurry. Thanks to my mom and my grandmother (who is now gone) for their rich heritage and inspiration. Follow on Instagram to see behind the scenes, at Rasika and Woodlands, snapshots coming up. On medium heat add the oil to a large and deep frying pan. Add the onions and green chile and cook for a few minutes, while occasionally mixing, until onions are soft and translucent, but not caramelized. If caramelizing turn down the heat. Add the ginger and cook for a couple of minutes longer while mixing. With a wooden spoon push the onions, ginger and chile to the side, making a clearing in the middle of the pan. Add the cumin and mustard seeds and cook for a few seconds. Mix onion mixture and seeds and add the frozen peas, turmeric and salt. Mix and let all the melted icy bits from the green peas completely evaporate, while occasionally stirring. You might serve as is or as a mash as shown above. 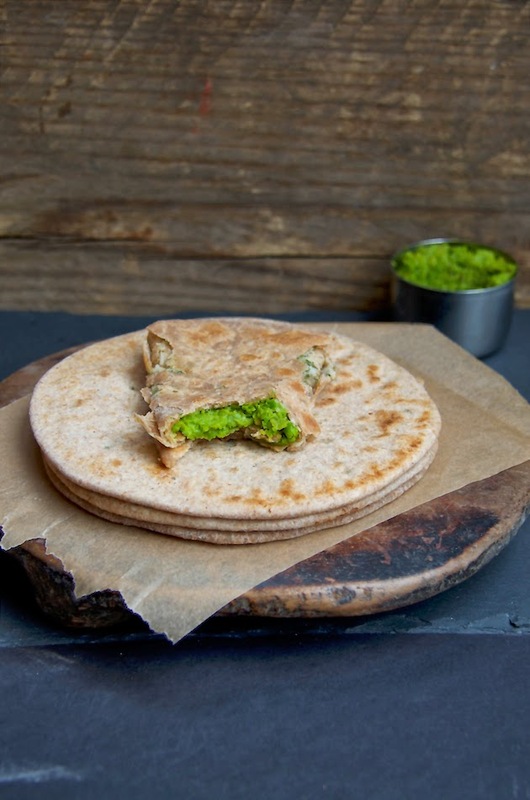 Serve this super simple and delicious spiced green peas with the roti, mint or gobi (cauliflower) paratha above. *Author's note: My mom uses this combination of spices but never makes it with peas only. She also doesn't mash the peas. They look fabulous and ever so mouthwatering! These are flatbreads I adore. A great post. TY so much, Rosa. It means a lot! Oh wow. My house is never without flatbread..but I'm not ambitious enough to make it from scratch. Wanna move in? Lol. Love these! Amy, it's easier than you think. It's the roti is basically like making tortillas. Tortillas have more oil. & I bet your kids will flip over the banana flatbreads. Not much better than fresh breads! And flatbreads. Swoon. Wow, what a fantastic experience. I spent some time in Israel, but actually lived in Lebanon for a few years. if your shuk is the same kind of outdoor marketplace as our souk was, it was a very magical, wonderful (although terrible smelling) place. 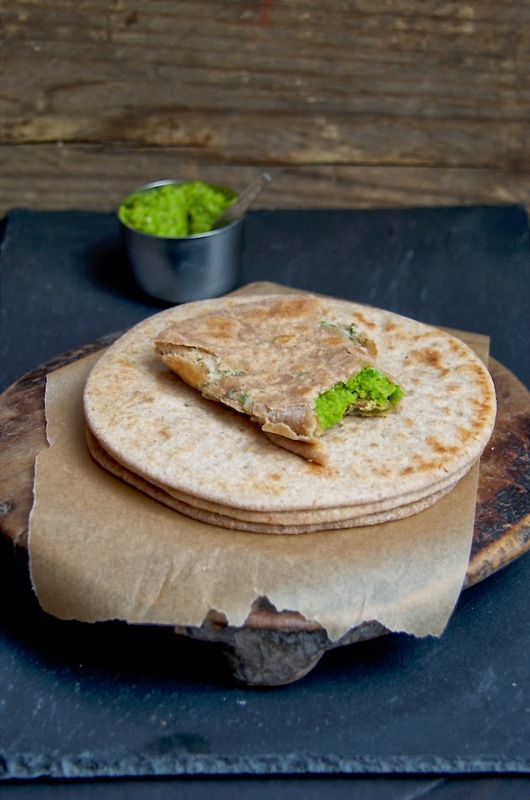 I think your flatbread is gorgeous and the green pea recipe looks delicious, especially mashed in the bread! You did?! :) Lebanon must be beautiful too. The shuk is actually as clean as a shuk can be but maybe I am sanitizing it in my mind?! :) & Thx so much! I am speechless, and you know that never happens to me. I haven't travelled internationally and I feel like I miss out on so much culture because of it. I think this is so impressive. I've never made flat bread from scratch but this has me chomping at the bit to try. Oh my goodness but that looks marvelous. I love those flatbreads and the green peas mash looks amazing! I loved reading about your grandmother and the flour mill! These flatbreads look wonderful and I will be trying them soon! Thx, Angie. Let me know if you've got a question when you make it. זה נראה מעולהההההההההההה, והלוואי ויכולתי לאכול את זה עכשיו!! I have a weakness for ALL bread. These look to die for. Lovely photos too. TY @ Milk and Honey! Fabulous article, Shulie! To say I'm proud of you is really sounding minimal...I'm SUPER PROUD of you and your creativity. Your photos are incredible! GO SHULIE!!! Aww TY, Lora. It's nice to know I have such a good friend in you. Happy Birthday to little L, today. Wow, what luck to have a teacher with those credentials help you craft your own magical bread. What a terrific article - well done! Gorgeous breads and fascinating story. How exciting and interesting you got to spend the time with these chefs and watch them work. It all looks delicious and I am thoroughly fascinated by the Mint Paratha! Beautiful!